Acupuncture has been used in China since ancient times to treat a wide variety of ailments. Along with a number of other eastern medical practices, this discipline is starting to see more widespread acceptance in the West. In fact, the procedure is now used to treat conditions ranging from muscle spasms to chronic back pain in NYC. 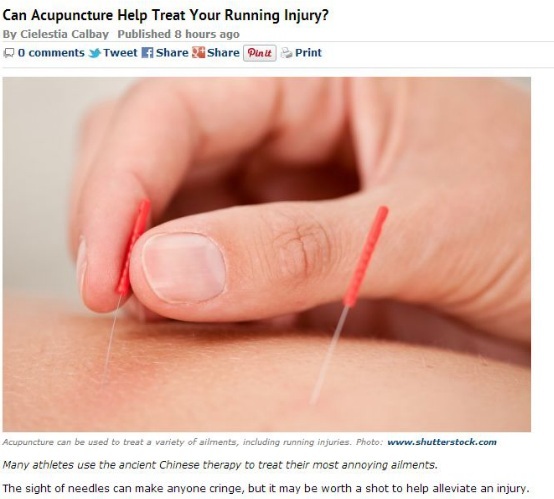 As an article from the running news magazine Competitor reports, acupuncture may also be an effective way to treat running injuries. It notes that several Olympic athletes, such as American long-distance runner Deena Kastor, frequently undergo the procedure to treat their injuries and find relief for the pain and inflammation they commonly experience. Acupuncture’s positive effects have been attributed to a number of factors. While some argue that the benefits of the treatment are merely brought about by the placebo effect, several studies have found evidence to suggest that it may be effective in treating a number of physical problems. Indeed, scientists note that this Oriental treatment can increase circulation and induce muscle relaxation in the targeted areas. Other studies have observed that the treatment seems to trigger endorphin release in the brain, thus creating a general feeling of well-being. Of particular note in the whole body of research that supports the use of acupuncture for treating sports injuries is a study by Shi Ping Zhang, Tsui-Pik Yup, and Qui-Shi Li that has established acupuncture’s potency in treating plantar fasciitis. Commonly referred to as jogger’s heel, the injury involves a painful inflammation of the heel that makes walking and running excruciatingly difficult. Another study undertaken by Matt Callison found that acupuncture can help reduce the intake of non-steroidal anti-inflammatory drugs among individuals who suffer from shin splints. The study divided sufferers into groups that received either a drug-only treatment, an acupuncture-only treatment, a combination of both, or no treatment at all, and found that the acupuncture and combination groups received the most relief. Elite athletes who see acupuncturists and chiropractors like Dr. Steven Schram for Chinese acupuncture in NYC do so for a number of common running related issues. These include shin splits; muscle tears, pulls, and strains; and localized pain at various points on their legs. Although the treatment may not be for everyone, especially those on blood thinner medication, its usefulness for treating sports injuries should certainly not be discounted.